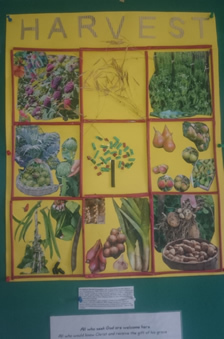 St Antony's ran a competition this year to design a picture or write a poem or piece of prose about harvest. 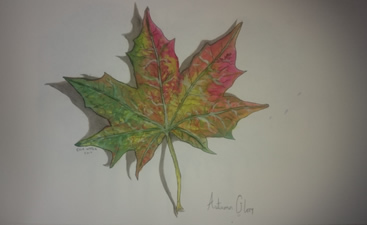 Below are the winning pictures and a lovely uplifting piece on Autumn . The Harvest poster was designed by Helen Howe, the Autumn Leaf was drawn by Ellie Wythe and Liz Lomax wrote the article. Congratulations to all the winners. 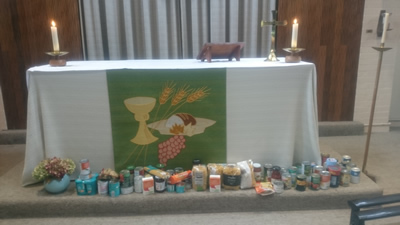 The first picture shows all the harvest gifts ready to be donated to the Purley Food Bank plus cash donations to the Red Cross . "Harvest - A time for celebration and giving thanks for all that has been created for us. There’s a very particular smell of autumn with mist rising from lightly frosted fields as low sunshine warms the countryside. Then we know it’s time to gather and give thanks again for the rich harvest of crops. We are blessed each year that the fruits of the season have matured and ripened and we can enjoy again the taste of hedgerow plants – blackberries, sloes, hips and suchlike. Farmers will have been busy cutting their cereals, bringing in vegetables of all sorts; allotment holders and gardeners will be picking their produce - beans, onions, gourds, all kinds of colourful and wonderful plants. These are a joy to see, touch and smell as well as to taste. Just before the dusk of cooler evenings draws in and stars sparkle more brightly, we may think this is the down time of the year when everything dies back, leaving only furrowed ground ready for replanting. But look – we can see again the beautiful structure of trees as they drop their brightly coloured leaves. Notice too as we crunch these leaves underfoot there are buds already forming on bare branches and even the soil may show the beginnings of growth ready to burst into life, to bring harvest produce and glory again next year. Let us stop, think again and wonder at this evidence of life, death and resurrection and give thanks that the miracle of creation never ceases. "